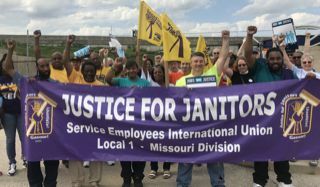 SEIU wins victory for janitorial workers at Express Scripts In an important victory for St. Louis union organizations, janitors at Express Scripts won a new deal with the company after joining the Service Employees International Union (SEIU). Janitors working at the pharmaceutical company’s St. Louis headquarters will now be contracted out to a new agency, starting when the employees become union members on June 1. The contractor that currently employs them, Centaur Building Services, was criticized by the janitors for offering low wages and overly expensive health insurance.